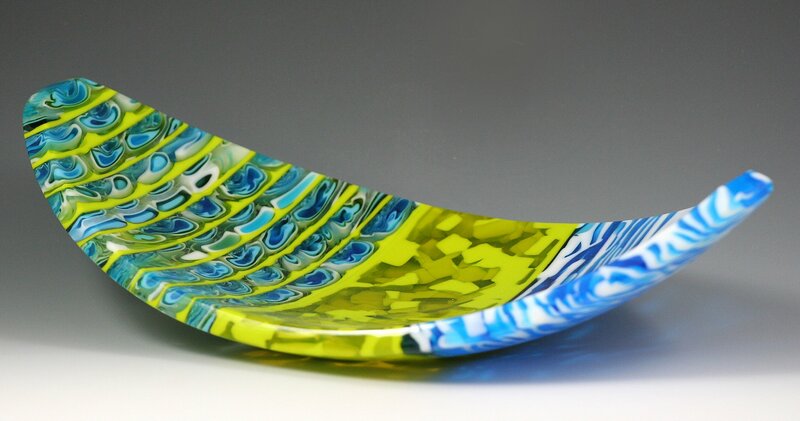 "Creating glass art provides me with some of the same satisfaction as cooking and sharing an elaborate meal. I begin with a thoughtful selection of design elements, and then I cut, layer, fire, and coldwork the glass, repeating until the piece is ready to be presented. All the individual elements are fused together to create finished art that can be savored for many years." Pamela Rice's parents encouraged creativity in their children, from music and art to handmade crafts. Rice's upbringing and her 15 years of experience as a graphic designer influence her glass work. The forms she creates include loving details, vivid colors, and a touch of elegance. Rice utilizes techniques from the old masters as well as the new to add interest and variety to her work. Rice combines custom-made murrini, hand-cut chips of glass, organic patterns from crucible drips and mesh melts, and strip-cut glass to create kiln-formed vessels, trays, and decor. Rice is primarily self-taught through experimentation, books on glass techniques, and online glass forums. She also had the privilege to learn from renowned glass artist Martin Kremer during one of his workshops.